This is the perfect appetizer for a happy hour among friends. 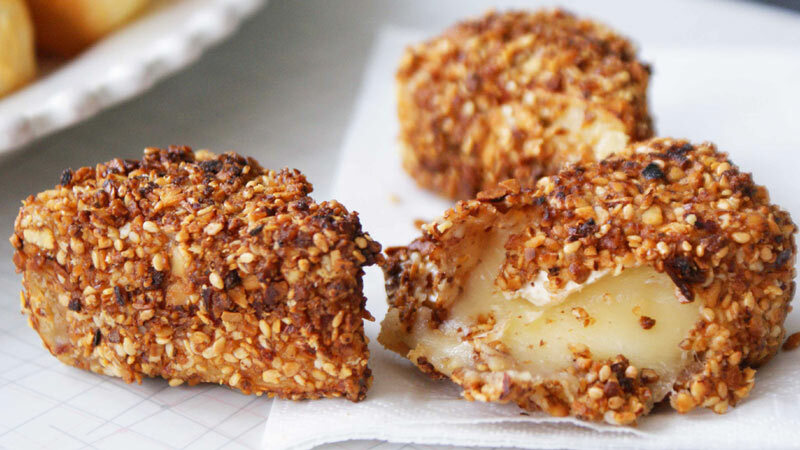 Just douse a wedge of brie in egg, coat with nuts, and chill. When you are ready to serve give them a quick turn in about an inch of hot canola oil. Have WildAire’s 2014 Open Claim Vineyard Chardonnay ready to pair with them. Freeze brie for 30 min. Finely chop nuts and combine sesame seeds, thyme and salt in a food processor. Transfer to a shallow bowl. In a separate bowl stir together egg and half and half with a fork. Remove cheese from freezer and dip each wedge into egg and then into nuts turning to coat and pressing the nuts to help them adhere. Cover with plastic and refrigerate until very cold-at least 45 minutes. Can be made up to 6 hrs. ahead. Pour about an inch of oil into a shallow pan or small skillet set over medium-high heat until hot but not smoking. (A piece of bread should sizzle when dipped in.) Working in batches, fry brie a couple pieces at a time until deep golden brown, turning as needed. Transfer to paper towels to drain and serve immediately, while still warm. Savor them straight-up or with a dab of pepper jelly if you have it. Serve with WildAire’s 2014 Open Claim Vineyard Chardonnay for maximum enjoyment!